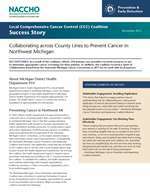 This success story focuses on the local comprehensive cancer control coalition efforts of the Michigan District Health Department #10. As a result of the health department's efforts, 250 primary care providers received resources to use to determine appropriate cancer screenings for their patients. The local health department employs approximately 170 people. The health district covers 10 counties and serves a population of approximately 261,000 people.